The app store has seen some terrific new releases lately, but Trainyard was one I almost missed. I assumed it was another rail switching game like yardmaster. Not even close. 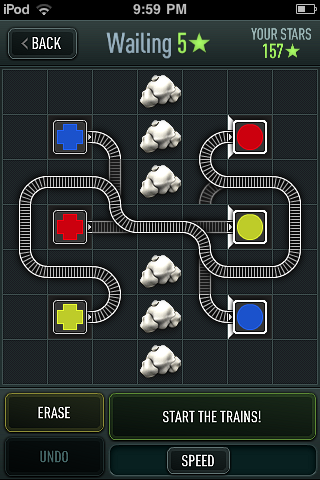 This is a great little puzzler in which you draw tracks in order to get trains to their destinations. That simple description doesn’t even begin to capture the gradual complexity that unfolds in the course of Trainyard’s 100+ puzzles. When you begin the first level by tracing a straight track path for a red train from its origin to its destination, you have no idea exactly how many variations designer Matt Rix will spin on this simple concept. Trainyard takes it’s time to reveal its inner depth, adding curves, colors, obstacles and crossings before getting the more complex stuff. Soon enough, you’re faced with destinations that only need one train, even though you have two. So you need to create paths that will make the trains converge and combine. A destination may need 1 purple train, but you have 1 red and 1 blue. Perhaps it needs only 2 orange trains, but you have 2 yellow and 2 red. How do you combine them and path them to the right place? The increasing complexity and diversity of the puzzles creates an incredibly addictive experience. The controls rarely get in the way of the puzzle solving. Path tracing works well most of the time, with a simple grid system to help with track layout. It’s easy to erase or undo wrong answers, and the game has a built-in sharing featuring that allows you to upload your own solution, or download some else’s. Really, it’s absurd to see so many good new puzzlers in so sort a period of time. Axe in the Face, Cut the Rope, and Trainyard would make the anyone’s Best App of the Year shortlist, and they all hit in the same week. 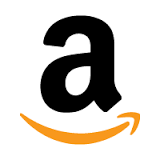 It’s a good time to be an app gamer.